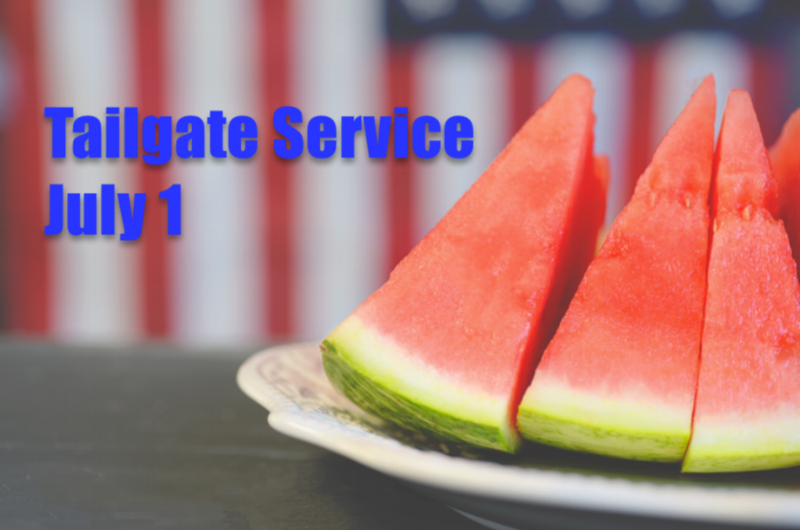 Join us this coming Sunday evening (July 1) for our Tailgate Service starting at 6pm. Bring some food and lawn chairs and plan to stay after the service for games and fellowship. All are welcome! You're invited to join the Harvest Baptist Church family at 6:00pm on Sunday evening, June 17th, for our Vacation Bible School Closing Service. Children who participated in Vacation Bible School will be recognized and given a certificate of completion. We will hear some of the songs and memory verses the children worked on all week long. We will also enjoy a visit from a special guest, "Shadow," and a memory video showcasing highlights of the week. After the service, join us for a Sno-Cone fellowship! 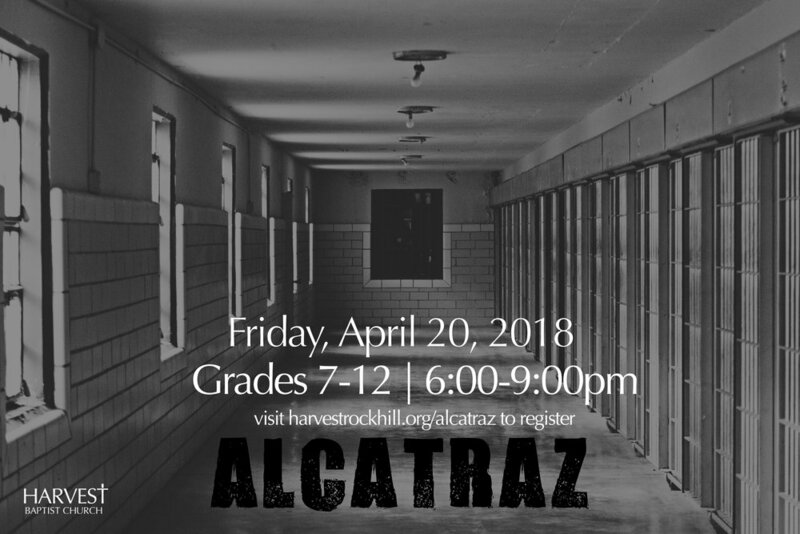 On Friday, April 20, 2018 Harvest Baptist Youth will host ALCATRAZ, a youth event unlike any other. There will be games, food, and a 200+ ft. cardboard maze to navigate and find your way out. There's only one way out. Choose wisely. Join us for Lessons and Carols on December 17! Meet at the church on December 20th at 7:00pm. Please use the form below to suggest families was can sing to on our annual caroling night. Name of the person or family who you would like us to visit. The address of the person or family who you would like us to visit. The month of prayer begins November 4, 2017. Free Outdoor Movie Night—"The Case for Christ"
Summer Shake-Up Begins June 4! The Summer Sunday school quarter at Harvest begins this coming Sunday, June 4! Come along as we begin our special "Summer Shake-up" schedule for Adult Sunday School. Curious about Harvest? Have questions you might have been afraid to ask? This class will provide you the opportunity to learn about the history, beliefs, and organizational structure of Harvest. This class will run all summer and is designed for those who want to know more about the church. This class is required before becoming a church member. With Gretchen Fant and Kim Baldwin, Hansen Building Rooms 302-303. Keys are important. They let us into our homes, allow us to drive our cars, and even give us the capability to unlock safe-deposit boxes at the bank. Spiritual keys are even more important because they unlock the truths we need in order to grow spiritually. This class will cover the essentials for spiritual growth and help you understand how to apply them to your life. "Managing Our Finances God's Way"
With Mike Yessa and Steve Plumb, Hansen Building Room 301. What does it mean to manage our finances God's way? What is this supposed to look like in our lives and homes? The Bible is full of wise counsel concerning our financial life. This eight-week class will examine different key principles regarding biblical financial management. Some of the lesson topics will include: Dedicate it all to God, plan your spending, giving as an act of worship, God's solution to debt, and how to enjoy what God has given you. "Spiritual Disciplines for the Christian Life"
With John Manthei, Hansen Building Room 304-305. Do you have a desire to be really real with your God? Do you want to move beyond the stage of normalcy and begin pursuing a life of holiness and godliness? We live in an undisciplined age, but it takes discipline to be godly. The only road to Christian maturity and godliness passes through the practice of spiritual discipline. 1 Timothy 4:7 says to "discipline yourself for the purpose of godliness" (NASB). This class will cover various important disciplines that we as believers can implement that will ultimately cause us to become more like Christ. With Kim Baldwin, Hansen Building Rooms 302-303. "Heroes of the Faith: Biographies of Sold-out Servants for God"
Various, meeting in the Auditorium. What does it mean to be "God's Athlete"? What does it involve to be greatly used by God? Does following Christ come with a cost? What can God do through a believer that is totally surrendered to him? These are some of the elements that will be examined as we step into the lives of five different heroes that God has greatly used throughout our Christian history. Sign up for Vacation Bible School Today! Operation Arctic: Exploring the Coolest Book on the Planet Vacation Bible School will be held at Harvest Baptist Church from June 12–16, 2017 (with a special closing service on Sunday night, June 18, at 6pm). Join us every action-packed, Bible-centered, and fun-filled day as we learn about God's Word, do crafts, cheer on our teams, enjoy amazing snacks, and play memorable games. Students rising to grades 1–6 are invited to come! Pre-register to secure your free T-shirt! Please join us for special meetings with Tom Farrell at Harvest Baptist Church. Childcare will be provided each night. Dr. Tom Farrell has been traveling in evangelism since 1979. His ministry has taken him all over the United States and to many foreign countries. He preaches in local church revivals, area-wide campaigns, Christian colleges, camps, and on many mission fields. He and his wife Regina have three children. They have a great desire to help strengthen the families of our nation. Twenties and Thirties Game Night! Twenties and Thirties are invited to come out for a fun Game Night on February 24th. The first step to knowing someone is knowing their name. Have you ever found yourself in the situation where you see someone whose name you should know, but you can't remember? And now you've been in church with them so long that to ask them their name would be completely embarrassing! On Sunday morning, January 15, 2017, Harvest will be having our first ever Name Amnesty Sunday. What is a Name Amnesty Sunday? Read more about this idea at this blogpost (click here). Everyone will be wearing name tags—pastors, deacons, Sunday school teachers, first time guests—everyone! Anyone should feel comfortable greeting anyone! So come out ready to participate. We look forward to meeting (and re-meeting) you. Join us October 7th for our Family Movie Night starting at 7pm! Rain or Shine!